Actually, the apparently much reviled Socialist Street was named Cabinet Street from 1784 to 1821. From 1821 to October 1918, it was named Ivan (?) Street (Ivanovskaya ulitsa), allegedly, after St. John the Baptist Church, which Wikipedia claims was located on the street itself (at No. 7). However, the redoubtable website Citywalls.ru says the church at this address was called the Church of the Transfiguration. Another source (K.S. Gorbachevich and E.P. Khablo, Pochemu tak nazvany? Leningrad: Lenizdat, 1985, p. 357) asserts the street was so called (Ivan is the Russian equivalent of John) because it “led” to the church of that name. The only extant St. John the Baptist Churches in modern-day Petersburg are the renowned Chesme Church at 12 Lensoviet Street, whose official name is, indeed, the Church of the Nativity of St. John the Baptist. But it is located approximately eight kilometers to the south of Socialist Street. An identically named church on Stone Island is nearly as far away: it is seven kilometers to the north of Socialist Street. This is not to mention the fact that most Petersburgers with more than a passing interest in krayevedenie (local lore and history) would know it was the current Pravda Street, which intersects Socialist Street and is so named because the first issue of the newspaper Pravda was run off the presses there in 1912, that long bore the name Cabinet Street, from 1822 to 1921. The street was called that because the quarter was inhabited, among others, by clerks from His Imperial Majesty’s Cabinet, the agency in charge of the Russian imperial family’s personal property and other matters from 1704 to 1917. Recently, there has been a vigorous public discussion of renaming Voykov subway station in Moscow, just as earlier, the renaming of Bela Kun Street in Petersburg was discussed. I will add my own five kopecks to the topic. The arguments of those who support renaming the station can be summarized as follows. Pyotr Voykov was a terrorist involved in the murder of the royal family and basically a bad man. Opponents of the renaming argue, on the contrary, that the charges leveled against Voykov are exaggerated, to put it mildly. Apparently, Voykov did not take part in the murder of the royal family personally (except that, along with other members of the Ural Soviet, he was party to the decision to execute them), and many other charges are based on articles published in the yellow press. (You can find the particulars here.) However, in my view, even if all the allegations against Voykov were valid, the station should not be renamed. Why not? On the one hand, toponymy is just as much as inalienable part of our history as folk songs, architectural landmarks, literature, music, and all the rest. Attempts to change place names many years after they emerged only because our attitude to historical figures has changed are just as much acts of vandalism as demolishing landmarks and destroying historic buildings. 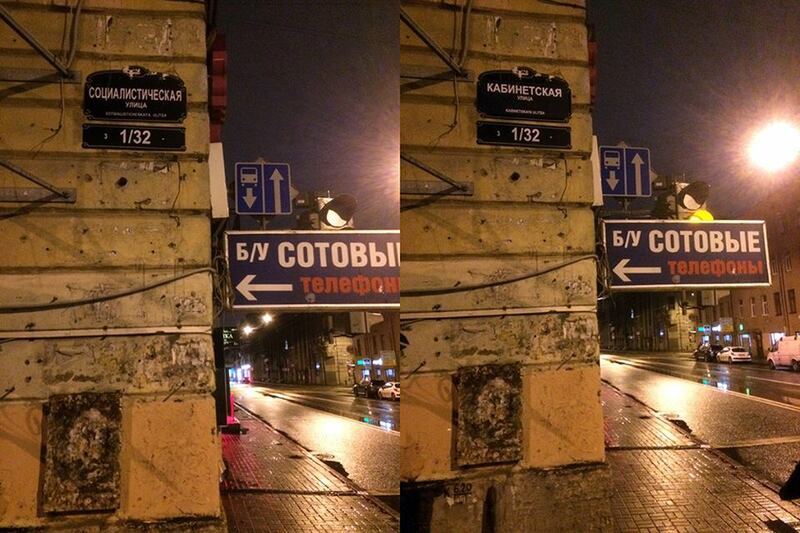 In my view, this species of vandalism is much more shameful than the similar renamings committed by the Bolsheviks. At least the Bolsheviks were consistent. They demolished historical landmarks because they wanted to start with a clean slate. Nowadays, on the contrary, the restoration of history is advocated, but the methods used to “restore” this history are Bolshevik and anti-historical. On the other hand, condemnation of the Bolsheviks is an attempt to judge figures of the past in terms of today’s standards. Such an approach, again, is anti-historical, and this pretext can be used to call for demolition of monuments to any historical figure. Let us condemn Peter the Great for killing his son and the numerous fatalities incurred during implementation of his projects, many of which, in all honesty, the country did not need. Let us condemn Catherine the Great for carrying out a coup and murdering her husband. Let us condemn Alexander I for complicity in the plot to kill his father. Sound good? Moreover, many of Voykov’s opponents say he murdered innocent children. However, the monarchical system was organized in such a way that these same innocent children might have presented a direct threat to their political foes, since they could have served as a standard around which monarchist forces could have rallied. Let us recall that the rule of the Romanovs began with the hanging of three-year-old Ivashka Voryonok (Ivan Dmitryevich), son of Marina Mniszech. But he was no more to blame (and no less to blame) than the Tsarevich Alexei. In addition, the current situation is also marked by flagrant hypocrisy. There is a lot of talk in Russia nowadays about national reconciliation. However, for some reason, reconciliation takes the form of dismantling monuments and changing place names associated with revolutionaries, while the cult of their opponents (primarily, the “innocent martyr and holy tsar” Nicholas II, who bore direct responsibility for the country’s downfall) is assiduously propagated. Excuse me, but I cannot call that anything other than a scam.